I try to upgrade my old Cerb40 II to TinyCLR. From what I understand I need to upgrade the bootloader to V2. I cannot find a V2 “dfu” file to upload to get the bootloader V2 in the MCU. Every topic I found with a similar subject has url redirecting to error 404 pages. I saw that thread, but the instruction is to load “TinyBooter_4_2_5_0.dfu”. So, if I understand how TinyCLR works, it needs something like “Cerb Bootloader v2.0.4.dfu”. I am able to load the old NetMF Bootloader in my Cerb40, but I cannot use TinyCLR Config software because the NetMF bootloader is not V2. 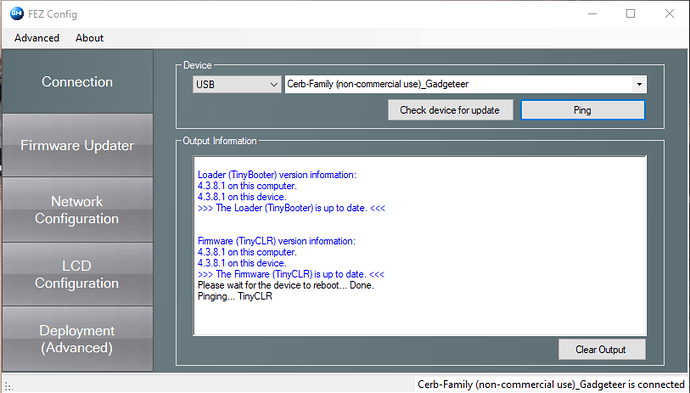 Then, where can I find the Bootloader V2 for the Cerb40, allowing me to use the TinyCLR Config tool? Maybe I am totally wrong and I can use TinyCLR with a device with a bootloader designed for NetMF!?!? I get hard time trying to find consistant informations. so check what version your bootloader reports?? But, according to that answer from Gus : https://ghielectronics.discoursehosting.net/t/update-tinybooter-with-fez-config/20709/6 the TinyBooter in my Cerb40 deserves Nothing. At the end of the previous there is a bunch of Bootloader download, but which one is suitable for the Cerb40? Does the version 1.0.0. of the TinyCLR exists for the Cerb family board?